Fr. Austin Fleming is a priest of the Archdiocese of Boston. Ordained in 1973, he is the pastor of Holy Family Parish in Concord, Massachusetts, and the author of Prayerbook for Engaged Couples and Preparing for Liturgy, both published by Liturgy Training Publications. His blog, “The Concord Pastor Comments,” can be found at http://concordpastor.blogspot.com. 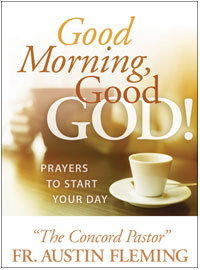 Here in one volume is a collection of prayers from the "Concord Pastor" that can be used to begin each morning. Whatever your state of mind and heart as you come to morning prayer, these prayers can jumpstart your own prayer to God.